Hi, everyone! Today starts the first installment of my Valentine's Day Lookbook Series. On Monday, Wednesday and Friday this week, I will be sharing a new Valentine's Day outfit ideas. This first outfit idea stemmed from my love of mixing prints. What other day of the year can you mix hearts and a grid print? Oh, everyday? Okay. My top AND my skirt is from the lovely plus-size shop, Re/Dress . I went to an Elle King concert a week ago with my best friend and stopped in to shop beforehand and picked up quite the little haul (expect a haul video this week). I love the atmosphere of the store and the message the owner and everyone who works there sends. 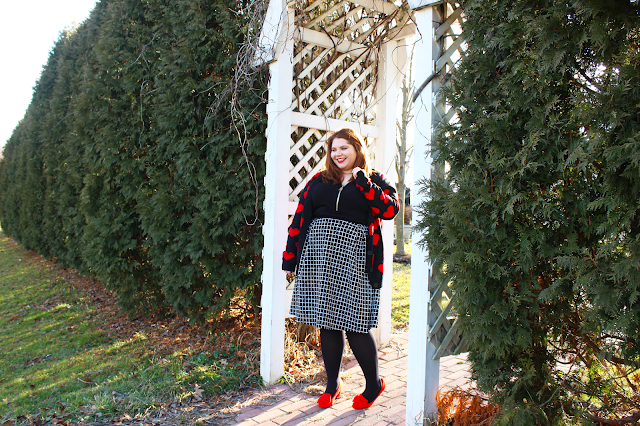 Two thumbs up for fat babes doing freaking awesome things in the fashion biz. If you haven't seen my video yet that shows all of my Valentine's day outfit ideas, check it out here! Talk to you peeps on Wednesday!